That is an awesome printable. My mom does Christmas dinner, so I am printing this out for her. Although I have no use for this printable I certainly know people who do! This will certainly yake some of the stress out of planning for a major dinner. This is such a great printable. I’m not 100% sure if I’ll be cooking at Christmas (we haven’t decided where we’ll be on Christmas Day.) But this could be used for other big meals too. 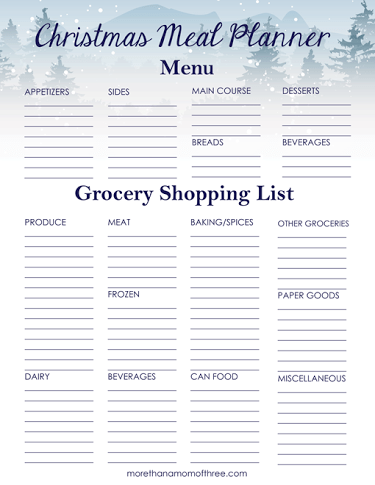 This is great for organizing the hectic holiday meals. I need to be more organized like this! That is a great printable. December always gets hectic between work schedules and trying to plan trips to the store and meals. I am going to print this and give it to my Daughter. She is making the Holiday meal. I is so nice to let others do the cooking. I am going to print this for my Daughter. Thank goodness I don’t have to cook the Holiday meal this year. I am going to bring a dish and that is about it. That is a great planner. I love the background. Michelle F. recently posted…My Secret to Quick, Beautiful and Shiny Hair! + Curls! I’m such a listmaker so I really appreciate printables like this. Thank you so much! Oh wow, this is great! I think I’m going to attempt a Christmas dinner this year for the first time so this will be very helpful! I am always looking to plan ahead during the holidays! This is a great help to me Thank you! Fantastic! I am all for being organized! Great idea! I’ll be making dinner on Christmas Eve this year, so thanks! Thanks for a great printable. I will definitely have to print this one out! I *always* forget a dish. Either I make it and forget to serve it or I forget to make it all together. What a great idea! I am never this organized, lol. Oh this is awesome! Just what I need to get the ideas and plans going for Christmas. Great tool! Thanks! This is so helpful! Holiday food shopping can be so hectic. It’s easy to forget things! That’s an awesome printable and one I know that most people can certainly use around this time. We host Christmas Eve every year for about 35 people and this meal planner is just what I need! Love all the planning, great tips and printables.